LUCKY SEVERSON, correspondent: There are big churches, and then there’s the Yoido Full Gospel Church here in Seoul, South Korea. It’s the mother of megachurches, with the largest congregation in the world. On a typical day 200,000 will attend one of seven services along with another two or three hundred thousand watching them on TV in adjoining buildings or satellite branches. 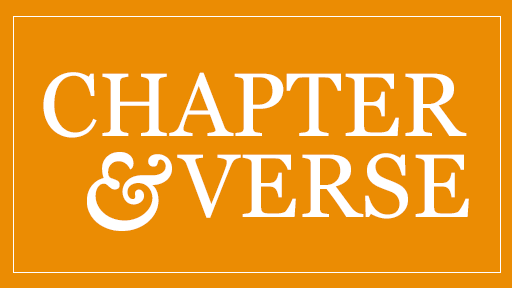 While some other churches may be losing members, this one just keeps growing. The main sanctuary here holds 21,000 worshipers packed to the rafters seven times every Sunday. Each service has its own orchestra, its own choir, its own pastor. There are hundreds of assistants. There need to be. Each service is translated into 16 different languages for visitors. Karen Kim is a pastor with the church’s international division. She says she was shocked when she first moved here from Australia. KAREN KIM: I think when you’ve got people this size, like you have to have structure, and you have to have organization, because otherwise people would be getting killed. Like you can’t just let it all just take care of itself. Like there has to be like organized rosters of volunteers and things like that to get people in and out of the service, or these people will literally die and get crushed. SEVERSON: The level of organization here is striking. Senior pastor Reverend Young Hoon Lee explains it this way. REVEREND YOUNG HOON LEE: Our church operates like orchestra. Every day we make perfect harmony and fantastic symphony. SEVERSON: Even though the first Christian missionaries arrived in Korea in 1784, the so-called Hermit Kingdom continued to be Buddhist until about 60 years ago. That was about the time Pastor David Cho founded what became the Yoido Full Gospel Church, which now has missionaries of its own in 67 countries. REVEREND DAVID YONGGI CHO: People don’t come to our church because I’m holy person, I’m spectacular Christian. No. They come because I supply their need. I meet their need through the word of God. 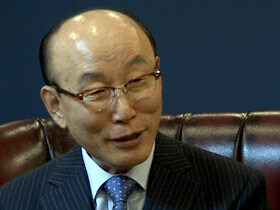 SEVERSON: Actually, Pastor Cho is one of the most revered evangelists in Korea. He was a Buddhist until he rejected his religion when he was near death from tuberculosis. He says that’s when Jesus Christ appeared to him in the middle of the night and told him to preach the gospel. So he did. When the country was suffering in poverty and desperation after the Korean War, he preached the gospel of hope through prayer. REVEREND CHO: Every morning at 4:30 people come to church, and they pray for one or two hours, and all-night prayer meeting on Friday evening. SEVERSON: Prayer seems especially important to this congregation. 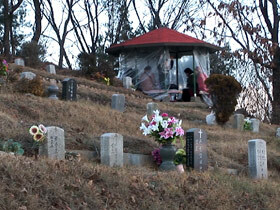 Each day buses leave the big church for the ride up to Prayer Mountain, which includes a sacred cemetery on a hillside. It overlooks a complex of buildings with a church, a hotel, and tiny, individual prayer rooms barely big enough to kneel and pray, which some do for hours. From a distance you can hear the sound of wailing coming from the top of the cemetery and people speaking in tongues. KAREN KIM: It’s very important to their faith, and speaking in tongues is a way that they communicate with God and that they allow God to communicate through them, and it’s evidence of the Spirit working in them and then being filled with the Spirit. SEVERSON: From only five members in 1958, Yoido Full Gospel, which is affiliated with the Pentecostal movement, grew to be the largest congregation in the world with over 800,000 members. Some satellite congregations have been released to become independent branches, although they’re still connected to the big church. There is more than one reason Yoido grew so big and so fast, but Pastor Cho believes women have a lot to do with it. PASTOR DAVID CHO: God gave me the idea because until that time women were despised, actually, in society. They were not given any important position, and the Spirit of the Lord said why don’t you use women? So I announced that I would start cell ministry and use women as the leader, and many men protested. They felt very bad about that, but I forced my idea. The women were so very happy, and they dedicated—they were excellent workers. KAREN KIM: They make up the majority of the membership in the church, and they really like to do a lot of volunteering. Historically, in church history Pentecostalism has been one of those areas and those branches of Christianity that has been more open to women pastors. SEVERSON: One reason Yoido has grown so big is because of its fundamental message, that if members give to God, he’ll give them prosperity, the same message found in numerous megachurches in the U.S.
REVEREND CHO: Many people are accusing me that I’m preaching the gospel of prosperity, but I’m not afraid of being accused, because if gospel could not bring prosperity to other people, suffering people, what can you do for them? Because gospel must bring prosperity in our spirit, soul and body and lives. If gospel bring destruction to us, why should we believe in prosperity? SEVERSON: But Pastor Cho says personal prosperity is good only if people become rich as well in their spirit and soul. REVEREND CHO: People try to bring happiness from their circumstances by being rich, by arriving their position in society. But those things soon pass away. They need eternal hope that is coming from inside out, not from outside in. SEVERSON: Tithing is a fundamental part of church doctrine. REVEREND LEE: Most members give tithes to the church—10 percent. With that money we help all the poor people in our society. SEVERSON: With so many members and so much in tithes, the church could be a powerful political influence in South Korea. But Pastor Lee says the church does not want to become politically active and instead puts more emphasis on the social gospel—helping the poor, like this project outside the church where volunteers collect and dispense clothing for those in need. KAREN KIM: They have a lot of those projects. I think not just in our church, but I think churches around the world are starting realize that the debate between, you know, the social gospel-just the gospel—you can’t have one without the other, because you both, and they need to work hand-in-hand if you’re going to make a difference in our world. SEVERSON: In the 1960s, Korea was one of the poorest countries in the world, with an annual per capita income of about $60. Today it’s around $30,000. South Korea is prospering. Pastor Cho says he knows one reason why. REVEREND CHO: Jesus Christ. That is the only answer we can give. You come and try to study the reason of prosperity. You can’t find out any reason, because we don’t have a good politician so far. We don’t have great business people. SEVERSON: And if Christianity is a factor in the prosperity of South Korea, Yoido is a significant contributor. Sixty years ago there were about 50,000 Christians in South Korea. 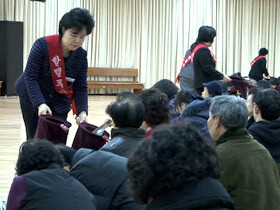 Today it’s more than 10 million, and almost one-in-ten were baptized in the Yoido Full Gospel Church. 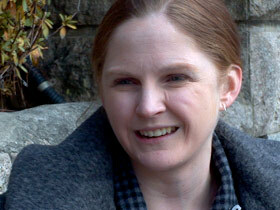 For Religion & Ethics NewsWeekly, I’m Lucky Severson in Seoul, South Korea. 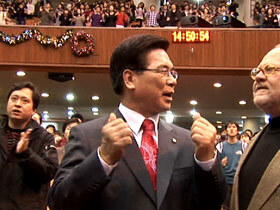 World Council of Churches: "Korean Pentecostal church reaffirms support for WCC 20th Assembly"